While strolling through my feed stats, I noticed that quite a few readers had been referred by Lucky Paperie. I had to go check it out, and what a fun find! 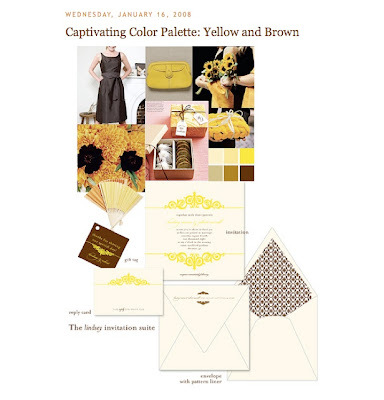 The blog is written by the owners of the Lucky Paperie invitation shop in is still pretty new, but there are some wonderful ideas there, including inspiration boards paired with some of their adorable letterpress invites. My favorite was the yellow and brown color pallete. This is a wonderful find--i love new and fresh paper desgins. Have you checked out Studio Olivine? She is one of my favorites. Thank you so much for sharing this.